There are many good things about Breaking Bad: the brilliant performance of the lead actors Bryan Cranston and Aaron Paul; the incredible writing and direction of Vince Gilligan, among the others. But the first thing that grabbed me (being a total sucker for beautiful photography) was the cinematography. The series' aesthetic is largely owing to Michael Slovis who started working on the show from Season 2. Do you remember the black and white, contrasty entry scene to Season 2, with a one-eyed bear by the swimming pool? That was the a beginning of Slovis’ magic. Breaking Bad has created a look unlike anything else on TV. An aesthetic full of bold contrasting colours and mirrored images (apparently being a representation of Walt’s state of mind split between two different worlds), burnt-in colours (recall stunning desert scenes? ), extensive use of natural light, unnervingly paced scenes, and lots of wide angles - all contributed to the cinematography that is both serene and edgy. 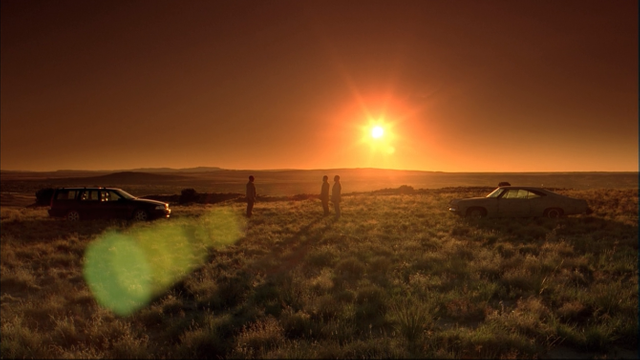 The cinematic, movie-like feel of the series was a conscious decision, but what really helped the process according to Slovis, was the fact it was shot on film and the creative freedom he was given by the director, Vince Gilligan. I take my hat off to both of them, Slovis and Gilligan. Michael Slovis wanted to approach this show like it was filmed from the 60’s to the 70’s. To him, Breaking Bad is a modern spaghetti western, and that meant using Kodak Blacks and lots of wide shots.